Invasive breast cancer affects one out of every eight women in the United States. According to the American Cancer Society, more than one million US women have the disease but do not know it. Although breast cancer is one of the most common cancers that affect women, there are effective ways to treat this disease. It is important, therefore to recognize its signs and symptoms as early as possible and to consult a doctor for proper diagnosis and treatment. Cancer of the breast that spreads to the outer portions of the breast and to the nearly lymph nodes is known as invasive breast cancer. When malignant (cancer) cells invade other organs of the body, such as the lungs, brain, liver, and bone it is then called metastatic cancer. IDC, or Invasive Ductal Carcinoma. This type of breast cancer involves malignant cells invading milk ducts, breaking through their walls, and attacking fatty tissues of the breast. If the abnormal cells stay near the tumor origin, it is localized. However, cancerous cells may go to the blood or the lymph and spread (metastasize) to any part of the body. 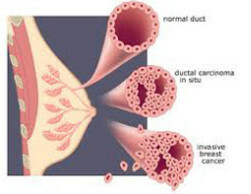 IDC accounts for 80% (most common) of invasive cancer of the breast. ILC, or Infiltrating (Invasive) Lobular Carcinoma. About 10% - 15% of invasive cancer of the breast is ILC, which originates in the milk glands (lobules). Its pattern of spread is like IDC. Most women will feel a thickening or mass in the breast tissue instead of lumps, which is more common in IDC. Women may find one or more of these changes while doing breast self-examination. Doing the breast exam regularly helps you get familiar with monthly changes normally occurring in the breast and helps you detect any abnormalities. What Are Risk Factors of Invasive Breast Cancer? Although breast cancer can develop at any age, your risk of having breast cancer increases as you get older. The American Cancer Society estimates that 1 out of 8 women who are diagnosed with invasive breast cancer are under age of 45 while 2 out of 3 women with the disease are 55 years or older when diagnosed. Aside from age, other risk factors include family history, racial background, socioeconomic status, geographical factors, genetics, radiation exposure, alcohol intake, obesity, smoking, and diet. Systemic treatments aim to destroy or control cancer cells and control their spread to other parts of the body. These may also be used to reduce the risk of cancer recurrence. More women are surviving invasive breast cancer because of early detection and adequate treatment. If you have any symptoms of breast disease or breast cancer, consult your doctor immediately to get early treatment.